The holiday season is right around the corner! Can you believe it?! I like to get a jump on my holiday shopping now because I do not love shopping packed stores, fighting crowds, searching for toys in unorganized chaos, grumpy or stressed out store workers, trying to park and all that. Nothing says “Merry Christmas” like people fighting each other over the “must have” toy for the year. Hayden’s birthday is also 3 days after Christmas so we have a little extra present shopping this time of year. While Christmas and birthdays have been on my mind, I had the opportunity to be introduced to the greatest toy store of all time. I’m not being dramatic either when I say that. Greatest. Toy. Store. Of. All. Time. 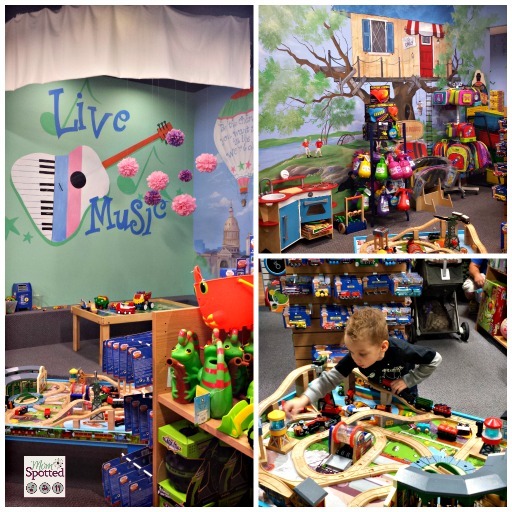 Brilliant Sky Toys & Books has the goal of being the “finest specialty toy store in America.” I have to say that they have met their goal. Especially as a busy mom of two little kiddos I really appreciate all they have to offer. 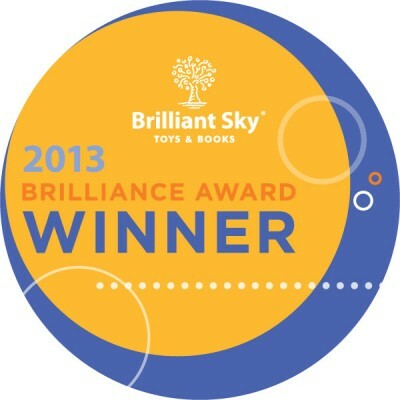 There are 15 Brilliant Sky Toys & Books across the country and I am lucky enough to live by one of them! I was so excited to take a tour of the Austin, TX store. Maya the store owner was kind enough to show me around and tell me all about her amazing store. First of all I was so impressed by the atmosphere of the store. It screamed kid friendly. The walls are so fun and covered with beautiful art work. 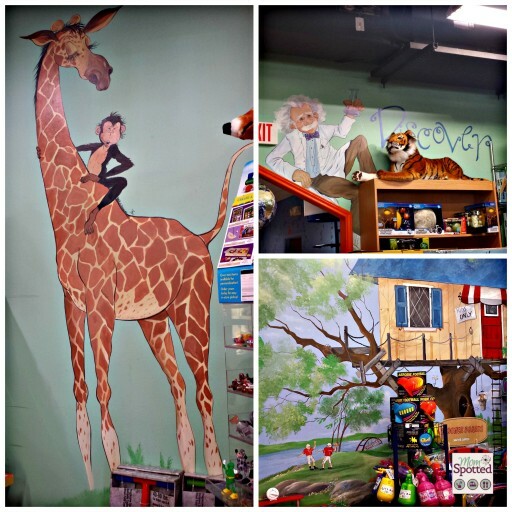 Gale Hinton is the artist behind all the gorgeous murals at every Brilliant Sky Toys & Books. I loved that Gale was able to personalize the store for Maya. There is a picture of her daughter playing on a tire swing under the tree house, Maya’s favorite toy as a child the “Cheburashka”(the little monkey in the red plane), as well as a few things that are unique to Austin. There is the Austin skyline, the capitol building, some Longhorn football players throwing around an actual “Pig skin,” the beloved Bevo and bats (Austin has the largest colony of bats that live under a nearby bridge)! Austin is definitely a unique place to live, Austin’s motto is “Keep Austin Weird,” and I love that the store reflected Austin’s unique weirdness. I really appreciated how much the store just made sense. Everything flowed and was organized. 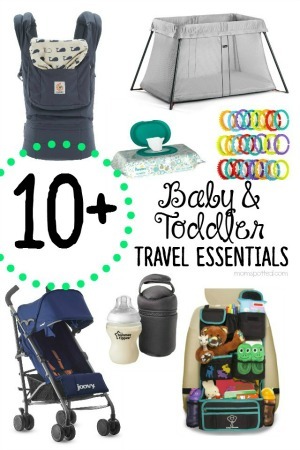 Puzzles, games, crafts, science, baby toys, outside toys, dolls, pretend play…everything had its own area. Sometimes when I am in the bigger toy stores I am walking around aimlessly trying to find something. I could easily find what I was looking for at Brilliant Sky Toys. I also really appreciated that most of everything was organized by age. All the games were together, but toddler or preschool games were on one side and older kid games were on the other. Easy and organized, two of my favorite things while I am shopping. There is quite a large selection of high quality toys from all over the world for age’s birth to about twelve. I thought the toy selection was great for all ages, for both boys and girls. I even saw some great classics toys I remember as a kid. Anyone else ever play with Playmobil? There is also a large Lego, horse, doll, and dramatic play section. We had a blast in the dramatic play area which is in a cute little play house. There is a a costume for just about anything you can imagine and the tools to go with it. Hayden loved the real looking tool belt and fire fighter tools. I really loved all the toys that would help Hayden learn. The science section was full of awesome dinosaur activities, science experiments, and other cool toys to help your little scientist make new discoveries. The metal detector, a real microscope, or a layer puzzle all about your body were some of our favorites! 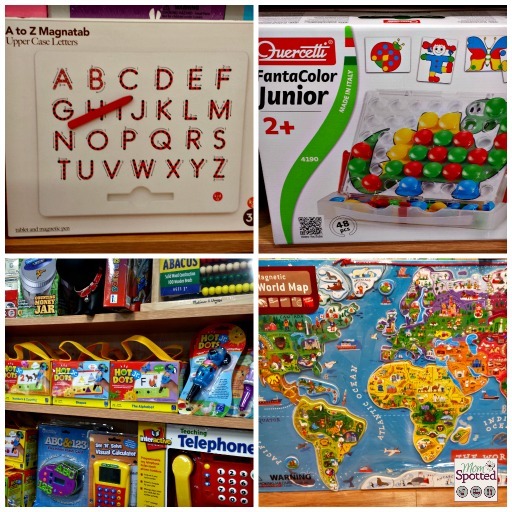 There is also a bunch of great toys perfect for learning letters, reading, writing, and learning other basic skills. 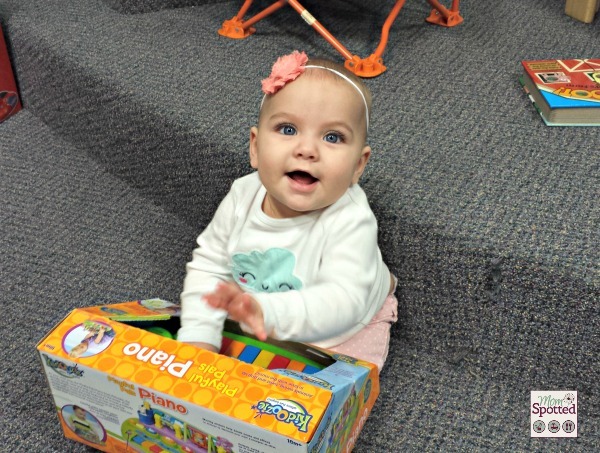 There are multiple opportunities for kids to look around, test toys, and have a great time playing. I love that most of the toys encourage learning or kids to use their imagination. Hayden LOVED playing with the Hape Marble Run. He would have played there all day if we had time. 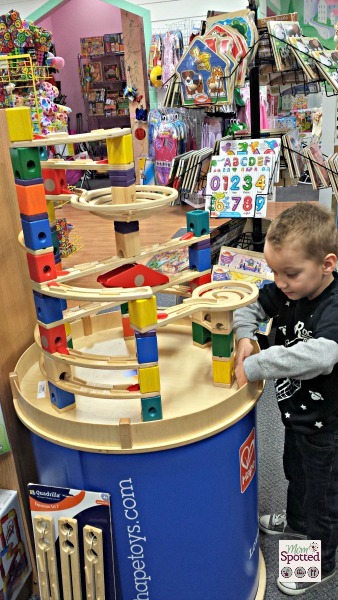 Hape also has a Marble Run that plays music as the marbles go through. Talk about cool! 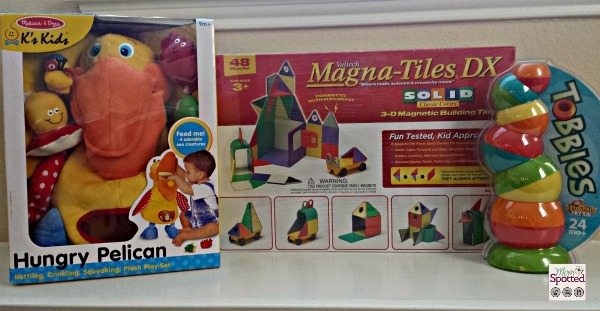 Right next the super cool Hape Marble Run were Magna Tiles and other building blocks or tiles. I knew Hayden would be drawn to them immediately. He is Mr. Builder and is always showing me new contraptions he has built. I have never seen him so excited about something and there was such a great selection. The entire store is perfect for testing out toys. The play area is big, open, and very kid friendly. There are so many toys for kids to test out. I am planning on going back soon with some mom friends and their kiddos for a play date. The store also offers story times, music times, and other events I am putting on my calendar. I can’t wait to take my kids to all the fun activities they offer. Hayden loved the Thomas Train set and the Wobble Deck. Halli even got in on the action with some fun toys and books. Brilliant Sky Toys has so many original, and award winning toys. 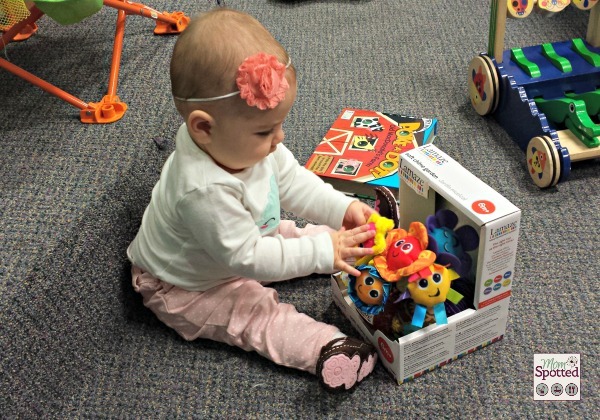 Maya is also able to personalize her store by choosing what toys are on her shelves. Maya mentioned how she loved feedback from her customers. If customers want to see a certain toy from Brilliant Sky that isn’t at her store she will try her best to get it for them. If customers don’t love a certain toy she wants to know so she can only carry the best. I really appreciated hearing that. I have bought toys before for Hayden that quickly broke or were difficult to use. I love knowing that all the toys are great quality at Brilliant Sky Toys and I am really investing my money into something that will last. In another effort to personalize the store Maya showed me in the giant book section. She has multiple books from local Austin authors. We LOVE books at our house. We read a lot and I am always on the hunt for new fun books. 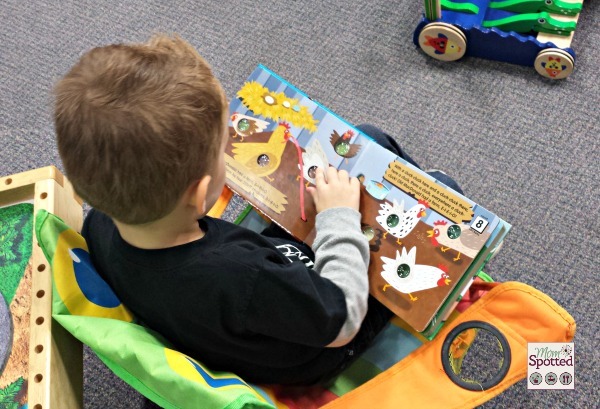 Hayden is also starting to read and I appreciated that Brilliant Sky Toys and Books carries lots of different early reader books. I’ve been unsure of where to find some for him and now I know exactly where to go! Some of the books I really loved that we will be adding to the library soon are two books by Austin authors, “Good Night Austin,” and “Shark vs Train.” Hayden thought the Wind Up books from Usborne were fun as well. The Wind Up books have little toys like race cars, pirate ships, or trains that wind up and really race through the books. Hayden and Halli also both really liked the Poke-A-Dot books. They are just like popping bubble wrap, and the books are darling with lots of different themes. 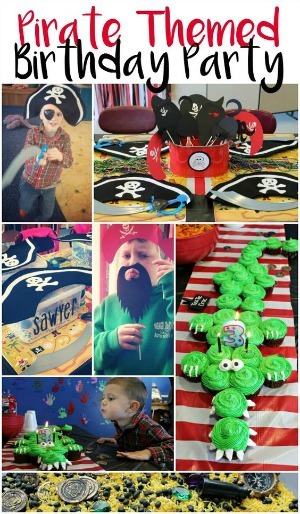 Have you ever been rushed for a birthday party? For example, you have an hour to get to a 5 year old princess birthday party and you still have no gift. Getting your kids ready, in the car, to the store, finding a toy, buying the toy while telling your kids “no you can’t have a new toy right now,” finding wrapping paper, wrapping toy, rushing to the party…madness!!! Brilliant Sky Toys has an amazing service for their customers. 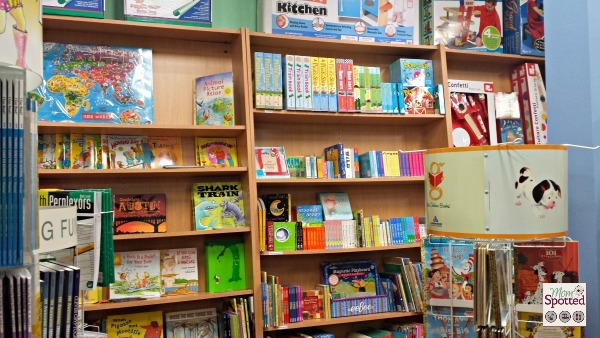 Anyone can go into the store then tell the staff the age, gender, a price range, and what the child’s interests are and the store employees are more than happy to offer suggestions. Also 3 more magical words that will make shopping less stressful and pain free: Free. Gift. Wrapping. I know!! So amazing, you think the store couldn’t get any better and it totally does. The staff at the Austin store was also so fabulous. Everyone that walked in was greeted and asked how they could be helped. 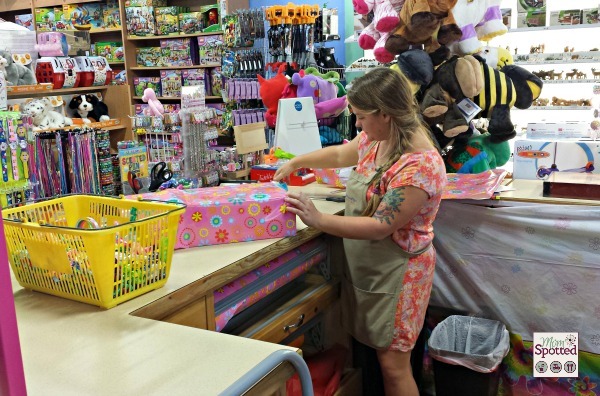 All the employees were happy and very knowledgeable about all the toys. 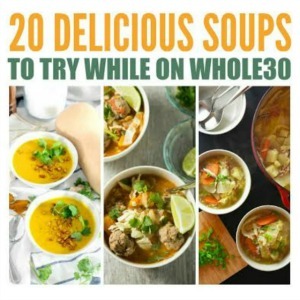 I heard multiple times customers walking in and giving a description of what they needed. Then as they are paying, the gift is beautifully wrapped, and they are out the door. At the Austin store Maya also offers curb-side pick up! No more dragging your kids in and out of the car. Just call and tell them what you are looking for, pay over the phone, and they will run it out to you when you arrive. 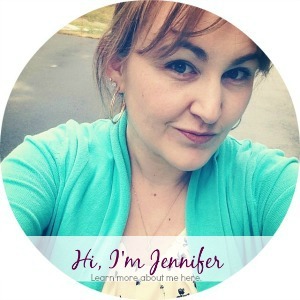 Not only will this be great for me as a busy mom, it is a great service for our out of state family. Grandparents, Aunts, or Uncles can call in toys and we can go pick them up. 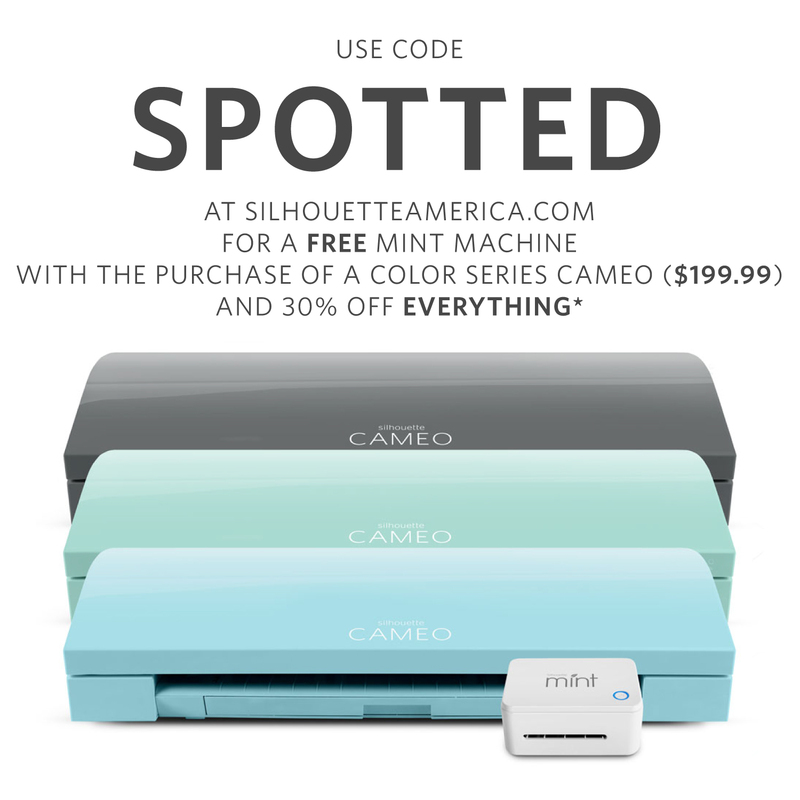 No more having to pay shipping! I was blown away by the customer service that is offered. I could have been there all day looking at all the different toys. 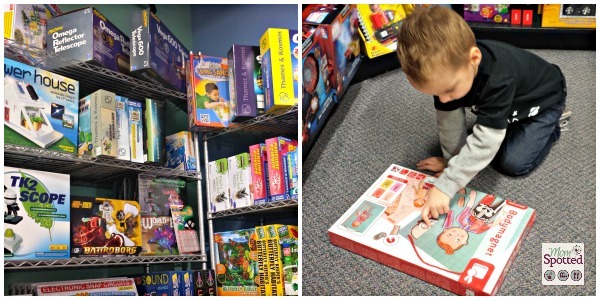 Both of my kids had a so much fun playing at Brilliant Sky Toys and Books, the store truly is every kid’s dream. I had my own motives of bringing my kids to the store, I wanted to see what toys my kid’s would really love. There have been a few times I think I have gotten “the perfect gift,” and then he plays with the box… After being able to play, and really look at all the fun toys I ended up getting Hayden Magna Tiles, and Halli The Hungry Pelican from Melissa and Doug, and a great stacking toy called Tobbles . 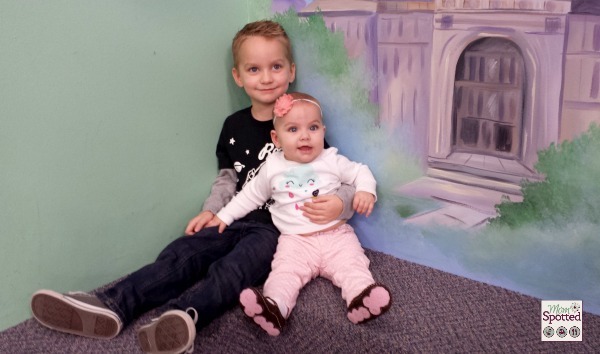 To say my kids had a good time would be a huge understatement. 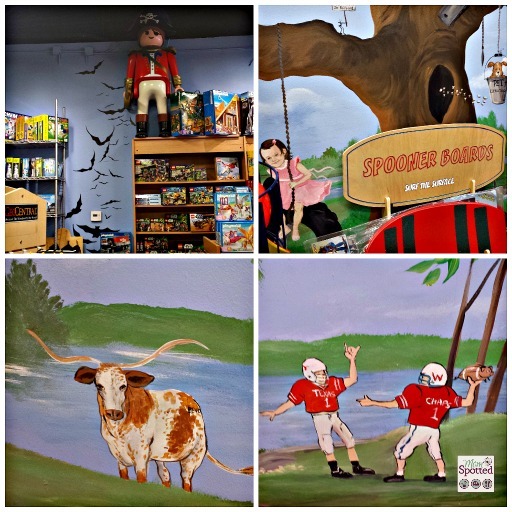 Our entire family had so much fun hanging out at Brilliant Sky Toys and Books, and I got more of an idea what they really would enjoy playing with. With all of the great services and toy selection that Brilliant Sky Toys and Books offers I assumed the prices would be much more expensive compared to other toy stores and retailers. I was so pleasantly surprised when their prices are more than comparable!! It made me love them even more if that is possible. I truly don’t know if I will shop anywhere else for toys anymore. 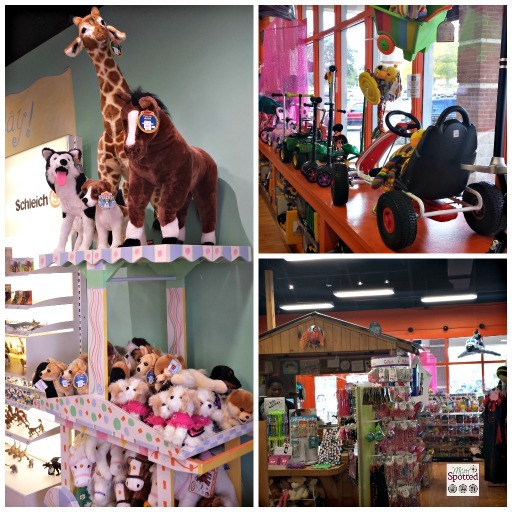 I could definitely tell that Brilliant Sky Toys and Books is passionate about kids, toys, and making a great shopping experience for all their customers. What a great store. I wish we had something like it by us unfortunately all we have is Barnes & Noble and Toys R Us. 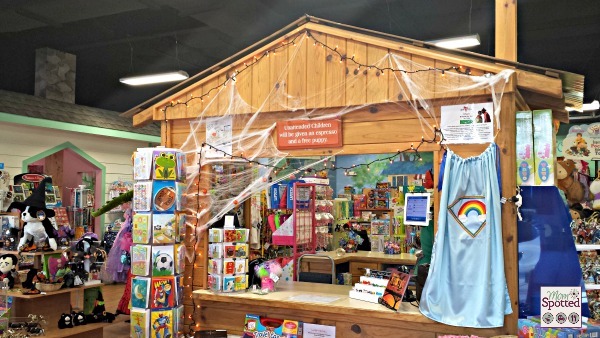 I love the idea of a different store to shop for my kids. What a cute and fun store. Reminds a little of Mr. Magorium’s Wonder Emporium. Definitely different and a cut above the rest! What a fantastic store! My city have a few cool independent toy stores but nothing as big as this place! My girls would want to spend all day here. I’m so jealous! I really wish we had a local store too. Thanks for so much detail and lots of pictures! This place is amazing! We don’t have any local toy stores like this around us. I could never take my grandsons in there because they would want me to buy everything and would never want to leave! What a neat store. I have never even heard of it. Looks like the kids had fun though! How fun! I have never heard of this store! What an awesome place to take your children. I’m sure they will have memories of this place when they are older. While I’m a fan of shopping online, I would actually venture out to shop at a store like this if i had on near me, and even pay a bit more for the experience. This store looks awesome! 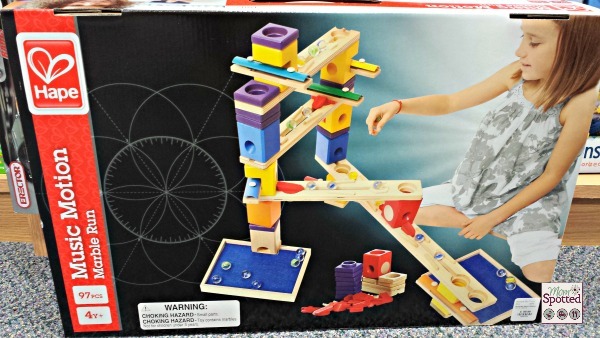 I love looking for unique/wooden/stimulating toys online, but there aren’t a lot of stores that sell items like this around me. I could spend hours in there, and I don’t think it would be possible to bring my daughter and leave without that marble run! This store has an awesome selection of great stuff to choose from. 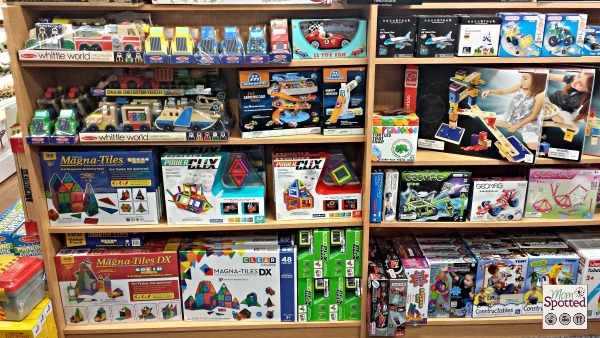 We have a store in our town that is similar with good quality, creative toys. I love that they have gift wrapping. Wow what an awesome store! .I loved that Gale was able to personalize the store for Maya!! Toy store is a Boys BEST friend! Even my daughter LOVES it too! My grandchildren would go crazy for this store. Okay … I admit it, I would too! This looks like such a great store, I like when stores have toys out for the children to test. This looks like a great store. I love that they do free gift wrapping! I wish we had one nearby. WOW!!! Looks like an amazing store! I wish we had something like that where we live! my daughter would be so excited in there! she could probably stay all day lol. so many fun things to discover! 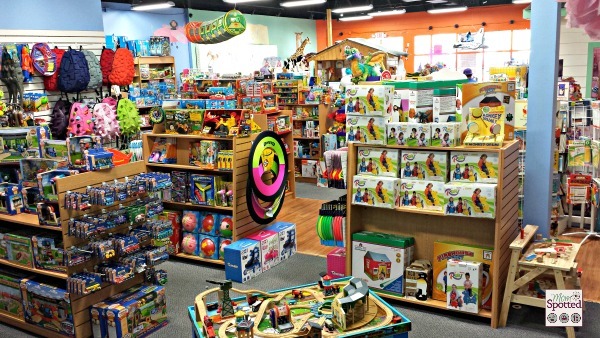 I love this toy store, cant wait to visit, They have all the brands I love and trust !! They have so much to choose from! We don’t have one in our area, but I wish we did. They have the neatest things! I wish there was a store near me. The next time we pass through Charlotte,NC, we are definitely stopping in! I’ve never heard of this store. I like that the kids can test out toys! 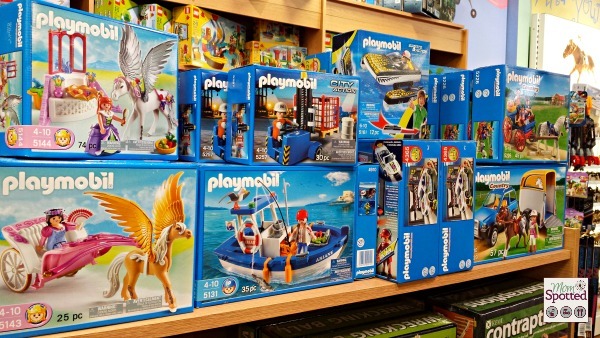 And they have a great selection of Playmobil. My kids love those toys. 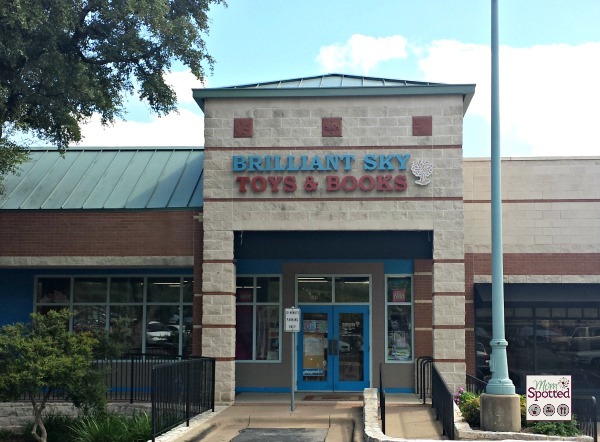 It’s too bad that we don’t have a Brilliant Sky Toys and Books near us as my children would love this store and so would I. Love the design of this store & all the brands that it carries!